Posted July 6, 2017 by C & E Acquisition Group & filed under C&E Acquisition Group, Healthcare Financial Management, Healthcare Patient Bad Debt. There’s been a major shift in the mix of healthcare payers due to the growth in high-deductible health plans and to increases in employee cost-sharing of employer-sponsored plans. As more people accept responsibility for more of their healthcare expenses, hospitals must collect more money from more payers who have more accounts with hospitals and affiliates. In the past, payments from commercial and government payers provided financial stability to most healthcare enterprises. Accounts with third-party payers were efficiently managed through computer-to-computer batch processing. Now, patients’ payments are critical to most hospitals’ financial viability. But the sheer number and disparity of low-balance patient accounts make collecting from patients cumbersome and costly for most healthcare providers. Most hospitals are not staffed or equipped to collect relatively small amounts on increasing numbers of patient accounts from a growing portion of their patient population. As the number of patient accounts increases, so will the number of patient accounts that go unpaid. Hospital executives know that the best times to collect money from patients are prior-to and at the time of service. While hospitals invest in improving their pre-service and point-of-service collection capabilities, they often alleviate post-service bottlenecks by outsourcing current patient accounts to early-out firms and then they place accounts that fall into bad debt status with collection agencies. Healthcare finance executives are usually satisfied with returns from their collection agencies because they are consistent and, therefore, useful for managing finances. But, often overlooked is the fact that their pool of bad debt accounts grows larger each month. 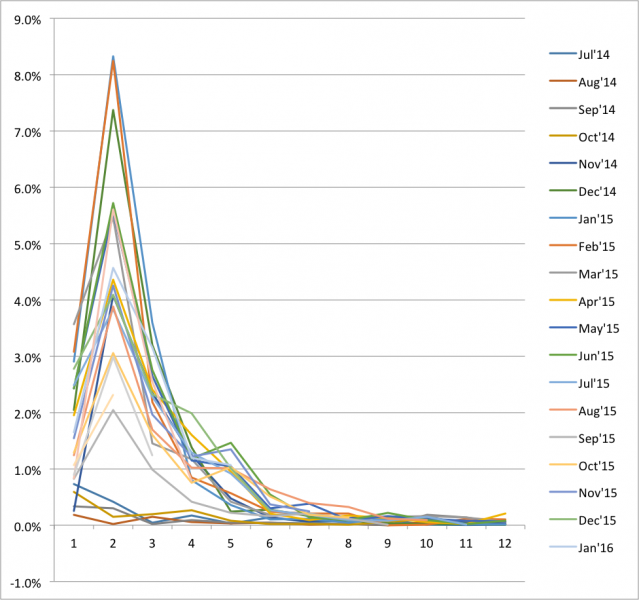 Monthly liquidations are consistent, but the yield on patient accounts shrinks each month. The chart depicts that if a collection agency liquidates 20% of $1M placed with them each month, the hospital gets $200K each month. After three months, the hospital will have gotten $600K, but the pool of still-unpaid accounts will have grown to $2.4M. The yield for the first month was 20%, but the yield for the second month shrunk to 12.5%, and the yield for the third month is only 8.3%. And — there’s untapped value in the $2.4M pool of unpaid accounts. Healthcare finance executives often assume that their collection agencies regularly attempt to contact patients who have not yet paid their share for the medical services they received. But, contingency agencies are staffed and equipped to work on new accounts. It’s too costly for them to attempt to contact patients after 60 days or so. Instead they focus on the new accounts they continuously get from their healthcare clients. In fact, 80% of monthly liquidations come from accounts placed with agencies in the past 60 days. Monthly liquidations are depicted on this Liquidation Curve using data from a collection agency’s standard monthly liquidation report. Overlaying monthly liquidations on monthly placements over a 21-month period clearly shows that results drop substantially after only two months followed by more drops between three and six months. Further analysis of payments received after six-months show that they are primarily recurring payments on established payment plans rather than new payments by newly contacted guarantors. With the pool of unpaid patient accounts getting larger every month and the incentive for collection agencies to work on new accounts, it’s important for every hospital to get a valuation of their patient accounts in bad debt status. Very few hospital executives and board members have any idea of the fair market value of these untapped assets — which is often hundreds of thousands to millions of dollars. Knowing the value of their patient bad debt accounts enables hospital executives to objectively consider some options. 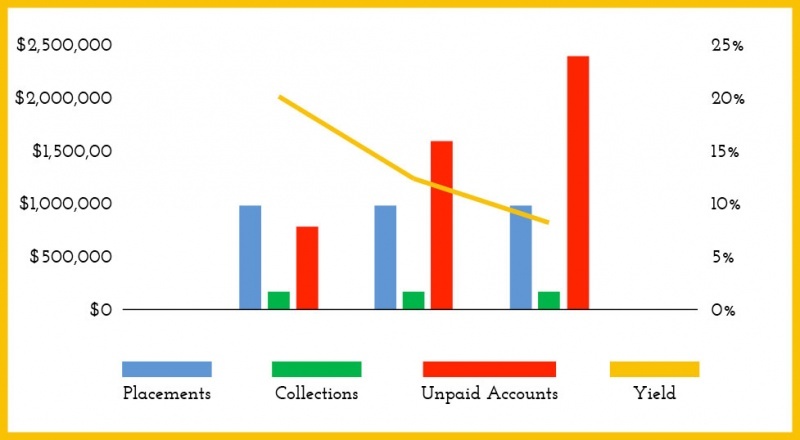 For example, money received from well-qualified debt acquisition firms that pay up-front for old, inactive patient accounts could be used to strengthen the front-end of hospitals’ revenue cycles and reduce the number of patient accounts that fall into bad debt status thereby increasing revenue and yield. Dedicated exclusively to healthcare organizations, C&E Acquisition Group provides capital and expertise to maximize the value of our clients’ patient accounts. By doing so, we help our clients fulfill their missions and improve the health of the communities they serve. Compliant, professional and caring, C&E Acquisition Group respects the provider-patient relationship while helping our clients get all the revenue they deserve for providing high-quality care to patients. Knowledge is power — Contact us today about a no-cost, no-obligation valuation of your patient bad debt accounts. What Makes C&E Acquisition Group Different?